"It is cardinal with us that the custody, care, and nurture of the child reside first in the parents, whose primary function and freedom include preparation for obligations the State can neither supply nor hinder."
. Our E-STAFF WON NETWORK OWNER/BOSS/FOUNDER MELENDEZ (prior state family case)was one, as experts from California,to NY/NJ/DE/PA.,tri-state nationally agree, was not suppose to be a case ending up in family court. But when it did, she refuse to "sign a document"from abhorrent cps worker(s) and sure did sue,when violated by DCF. Ext.806 (read entire page everyone prior to calling our very busy EFFECTIVE caring network today. )Thank you. (Weekend of 4th of july)never at any time knew, that when she "drove off, that her girls would soon become a victim of atrocities, nothing short of inhumane,"as several experts, in california put it, "nothing short of inhumane" with experts weighing in for years from chicago,PHILLY,PA, to DE.,NJ,to MD.,NC., all courtesy of a state agency CPS who are suppose to "care" about the'best'interest of a child and not fabricated state evidence,nor commit perjury to a material fact,insofar as healthy,happy,sane well-taken care of children." -She did not allow such violation gruesome injuries to continue to darken her life as her girls." FAMILY SUED. As simple as that. The loving innocent good family facilitated their timely filed lawsuit and won. 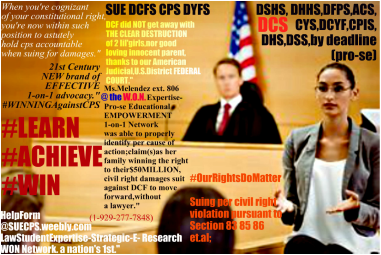 each hurdle needed to see to it such winning suit would move forward,in our U.S.DISTRICT FEDERAL COURT..."
Such critical thinking skills,a passion for clear justice encompassing reasonable logic,investigatory astute prudent razor-sharp mindset of Ms.Melendez allowed her to present her own lawsuit for a civil right violation,as her girls,their suburban loving good family when "lawyers" whether from california to the nyc/nj/pa/de tri-state all said,"it can't be done. "She was able to properly artfully present such lawsuit for damages,in accordance,pursuant to U.S.C.A.Title 42 section 1983;85;86 et.al., while lawyers were continually misleading her, for which she wisely ignored,and made sure she executed her suit,as her girls, to prosecute such state employees, per violation of their rights." Lawyers now coast-to-coast continue to laud her for such incredible knowledge,and overall presentation, when she is suing for damages,and winning all on her own with her family when clearly violated for years, by a state employee(s)who was bound by law to protect the child,reunite,and or refrain from removing 2 un-abused happy sane lil girls,who, because of their unwarranted removal, has suffered tremendously as their loving mom,who nevertheless throughout her suffering has continued to build W.O.N. NETWORK so that others will NOT be mistreated and or if are violated by CPS,will be able to learn,through EMPOWERMENT/EDUCATION insofar as suing timely by deadline, CHILD PROTECTION,CPS. -See child/hug child/nurture her girls/educate her girls/tuck her girls in bed at night,at just seven years old & 10. -Bring her girls home refer to as"Gia & Tia." DYFS(dcpp/dcf employees)worked hard.at unlawfully barring her from her own girls. "CPS employees hence are therefore, liable. 1-929-277-7848. FEDERAL COURT MAGISTRATE has allowed her/the girls damages to move right on forward,for a numerous amount of violations,severe gruesome injury(the girls)along with loving mom. CPS failed at each turn everyone...Such employees for such child protection agency lied, falsified, withheld, all the while the state worker knew and or should have reasonably known, as case law support nationwide, the child as mom had a right to be at home together, enjoying their lives,and to not be subjected to such violation by a state employee et.al, encompassed with the fact the worker knew all along such suburban loving parent was innocent." FEDERAL JUDGE has heard and has therefore handed down justice by allowing her LAWSUIT to move forward." -File suit for damages pursuant to SECTION 1985;86;83 et.al., along with other state/federal violations. -Properly handle her own from start to conclusion. Won the right to see her $50MILLION DOLLAR DAMAGES SUIT MOVE FORWARD,all without counsel. Now, Melendez continue to focus on LAW SCHOOL implementation...Inspiration for all truly violated. She did not let a "lawyer" telling her"no" to preclude her from fighting long, and fighting hard for justice. ​Child Protection Services caseworker lawsuit are growing for such false allegation insofar as such "failure" by a loving parent who clearly has not harmed their own child. So many have called our hotline,who are now blessfully suing timely by DEADLINE(correctly suing) and are holding #dcfs #CPS #dcf #dcs employees pro-se level(self file) holding such caseworker,supervisor et.al, accountable worldwide." ext. 102 Whether in Arizona, Nevada,California,Nebraska,Iowa,Utah,Connecticut,NJ,Maryland,DE.,MI, to Vermont, Washington,Oregon,to Minnesota,Michigan, Oklahoma, St.Louis,to Boston,Massachusetts,New Hampshire, you're within your right everyone to realize that,"if a lawyer is not within the time allotted by law,suing for you,do not sit online waiting and letting days,nights,weeks,months pass you by,when DEADLINE (As case law support)exist and shall bar you, before you know it,when CPS has clearly destroyed,undermine your right to your child,grandchild & family." If our founder has done it, then there is simply no valid reason insofar as why you're still not suing CPS. The W.O.N. E-LawStudentExpertise ResearchTeam,Expertise-Winning live chat/discussion et.al, when suing by deadline C.P.S., #ANationFirst #OurRightsDoMatter 1-929-277-7848. ​Excessive Corporal Punishment-false allegation against parent lead to a $50 MILLION damages civil rights suit winning right to move forward,as seen on news,for a suburban mom/2 girls. "Story was on the news multiple times,of our staff member who refuse to "give up"and stay online complaining. She realize time was running out and executed(propery)her lawsuit." ​Yet, shocking the conscience of all, a employee,for the state, an assigned caseworker hid the fact the child was not hurt,nor injured and was healthy,alert,happy. State employee lied under oath & then pretended that the owner girls, were "thriving under state supervision, while additionally keeping girls from mom & knew the entire time, all she had to do was advise the family superior court judge + do what was right,by returning her girls." Lawsuit was done right, and with such precision, focus throughout for our owner/founder #winner who didn't let employees at DCPP/DYFS.DCF CPS agency get away with the clear destruction of her girls,and her family,all done by pro-se method. -As you will read throughout informative factual page, and be sure everyone when you're calling in, to fill out our e-help form first,or your call shall not be connected, thank you." (Speak DIRECTLY to the owner on this relevance when you are gearing up to sue today,CPS. During your free 1-on-1 session, always ask about the winning suit(s)you're reading here so you're able to validate if you are not able to do such on your own. and know that it all begin with YOU, when you're violated to sue,and sue timely correcly and take back your right,when you are suing #CHILDProtectionServicesEmployee PER VIOLATION of your state/federal right." #SUECPSBYDEADLINE pro-se self file while you're still having time to proceed to do so." Failure to take care of your own child.